Villa Ria apartment is strategically located on 2 acres of residential land along the main road of Jalan Tanjung Bunga with easy access to nearby renowned hotels, convenience store, post offices and banking outlets in the area. It is a 17-storey low density development with only 60 apartments and 12 penthouse units over 2 acres of land and one can be assured of privacy. All units are sea-facing and equipped with individual corridors. 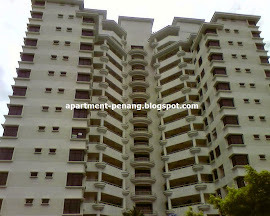 The neighbours of Villa Ria include Menara Asas, Marine Mansion and Cara Vista. 24-hours security, car park, visitors car park, rock waterfall, landscape garden, management office, community hall, swimming pool, wading pool, gymnasium, table tennis room, children's playground, BBQ-pit, intercom system. Present Villa Ria owner asking price for 1150 sf for $880K is ridiculous. This Condo is 10 years old and newer condos with better facilities around the same area are only $500 a sf ft. So how can they justify the $765 sf asking price is beyond me. Hi Sellers and Buyers , kindly contact me if you have Villa Ria list for sale or Interested to know more for purchasing. I am an Specialist for this developement and will assist at my best.